Kenda tires built their company reputation over the past 50 years on selling low cost, durable tires. That’s good news if you want a great tire for your Cruiser motorcycle. 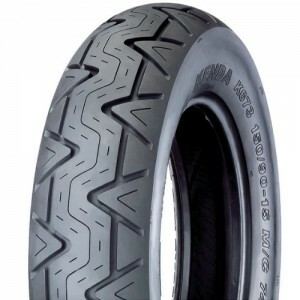 Not only does Kenda design motorcycle tires but they also ATV, automotive and specialty tires. Knowing that you can be confident that the Kruz K673 tires will hold up to any conditions you throw at it. The Kruz is constructed with a secret, new rubber compound that’s designer for improved performance. Not only will it help with cornering ability but it has also been shown to increase mileage. This new Kenda tire is available in a wide range of sizes that are likely to fit on your favorite ride. It weighs about 22 pounds which confirms that this tire is overbuilt. When you look at the K673 tires you’ll immediately notice the unique tread design. Kenda engineers developed the wide grooves to help the tire handle all weather conditions while cruising. Not only will this tire handle a variety of conditions but it’s also H-rated. That means the tire can perform at speeds of up to 130 mph. Now that’s what I call speed. If you like to take your cruiser motorcycle on long rides, you’ll be glad to know that this tire was specifically designed for today’s larger bikes. The tires is able to carry heavy loads when you need to fill your saddle bags on extended trips without having to worry about the additional stress on your tires. For anyone that wants a tire that lasts a long time but doesn’t want to spend a fortune, the Kruz is the one for you. If you live in an area like I do where there’s more rain than sun, you’ll be glad to know that these tires have exceptional traction. As you can see Kenda over delivered again with this tire and will continue to do so in the future. This has proved to be a very durable tire at a great price. Why put your trust in any other tire?